One of the great mysteries of the past few years is where have the jobless gone? The U.S. employment participation rate has dramatically dropped, to the point that if we had a 'normal' participation rate, the unemployment rate would be about 2% higher. Some of these folks probably are back in school, while others have 'retired early', but it cannot explain the majority of the drop off. In 2010 alone, the number of people enrolled jumped by half a million which can help us explain part of the huge drop in workforce labor participation in the U.S. (some 2M Americans have simply dropped off the map) If a somewhat similar number was seen in 2009 (which looking at the 45 degree angle of growth in the chart below would appear very likely) that would explain away half of the 2M Americans who have disappeared from the workforce. Of course as the % enrolled has doubled, the cost has actually tripled since 1990 - from $40B a year to $120B annually. That would place the cost above food stamps + welfare combined. That's all fine and dandy, if that's how you want to run an economy and stuff millions 'off balance sheet;... but we seem to have hit an issue. This program was not designed for 5% of the American working age population to partake in. Costs are exploding higher. Per new Congressional estimates we're headed for another insolvency (and coming bailout). It's more Ponzi scheme economics. Laid-off workers and aging baby boomers are flooding Social Security's disability program with benefit claims, pushing the financially strapped system toward the brink of insolvency. Applications are up nearly 50 percent over a decade ago. The stampede for benefits is adding to a growing backlog of applicants -- many wait two years or more before their cases are resolved -- and worsening the financial problems of a program that's been running in the red for years. New congressional estimates say the trust fund that supports Social Security disability will run out of money by 2017, leaving the program unable to pay full benefits, unless Congress acts. About two decades later, Social Security's much larger retirement fund is projected to run dry as well. Much of the focus in Washington has been on fixing Social Security's retirement system. Proposals range from raising the retirement age to means-testing benefits for wealthy retirees. But the disability system is in much worse shape and its problems defy easy solutions. 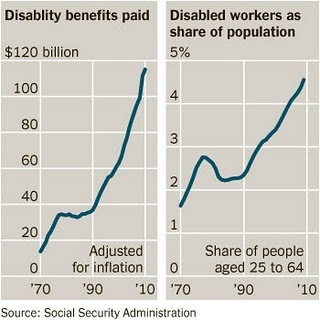 This year, about 3.3 million people are expected to apply for federal disability benefits. That's 700,000 more than in 2008 and 1 million more than a decade ago. "It's primarily economic desperation," Social Security Commissioner Michael Astrue said in an interview. "People on the margins who get bad news in terms of a layoff and have no other place to go and they take a shot at disability,"
The disability program is also being hit by an aging population -- disability rates rise as people get older -- as well as a system that encourages people to apply for more generous disability benefits rather than waiting until they qualify for retirement. Retirees can get full Social Security benefits at age 66, a threshold gradually rising to 67. Early retirees can get reduced benefits at 62. However, if you qualify for disability, you can get full benefits, based on your work history, even before 62. As policymakers work to improve the disability system, they are faced with two major issues: Legitimate applicants often have to wait years to get benefits while many others get payments they don't deserve. Last year, Social Security detected $1.4 billion in overpayments to disability beneficiaries, mostly to people who got jobs and no longer qualified, according to a recent report by the Government Accountability Office, the investigative arm of Congress.